I've now made these twice… so easy & delicious. I made 11 instead of 14 (4 pts each) and used water instead of milk (only because I was out) and they still turned out amazing. Gina, I cannot thank you enough for this website. It's my new go-to and I've told all my friends about it too! I went to get the ingredients for these last night. Can't wait to make them. BUT I forgot to buy the stupid biscuit mix 🙁 So back to the store i go. All I can say is Make them. They are delicious. I wanted Papa Gino bread sticks today and thought I remembered saving this cheese biscuit recipe. Well, I finally got around to making it this month and as I type, I 'm eating them. so darn good. No need for papa gino bread sticks any more. A friend pointed me in the direction of your website – I love it! Just thought I'd pass this along . . . I've been making these biscuits substituting water for half the milk. (A Red Lobster employee told me that they use water for their biscuits). I have not made them with the heart smart bisquick – but using regular – and substituting water – made for lighter, "fluffier" cheddar biscuits! Again. . . love your website! These are so good! i even accidently burnt the butter parsley garlic mixture and they were still awesome! Made this with the bolganase sauce which is SO good! These are great!!! Love them! these are the BEST biscuits I have EVER had!!! I highly recommend them, they are salty but not too much salt, they have the perfect amount of garlic in them as well. These look incredibly delicious. What a great flavor combination! I'm embarrassed to admit how many times I've made these and just eaten them as my whole meal. 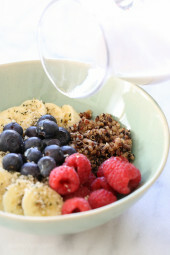 Everytime someone comments on this, I want to whip out my bowl and make another batch! Tonight was my 1st time trying this recipe, and it was a huge success!!! I didnt think my 4 kids (all under 7 yrs old) would like them, boy was I wrong they were asking or 2nd and 3rd biscuits!! !Thank You for the recipes. 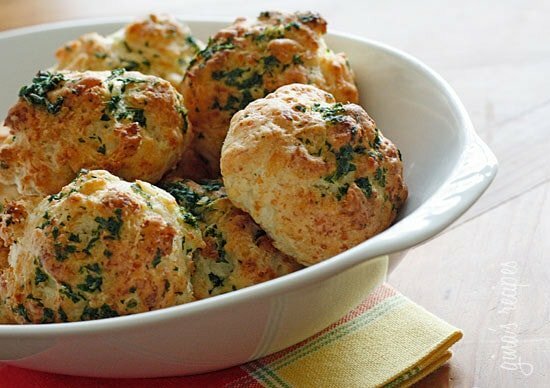 I just made these with Parmesan cheese instead of cheddar and they were SO GOOD! Thanks Gina! Craig I'm not sure how that effects the points, you'll have to plug this into recipe builder. How bad would the calories be if I use regular Bisquick? I think that is all we can get in the UK. These are the exact same thing that a B&B in Canada made, but the cow running the place refused to give me the recipe! Needless to say I never went back to that place again! Thanks for posting!!! These biscuits are amazing! My 23-year-old brother likes nothing, and has made cooking healthy for the family difficult. But he LOVED these biscuits, as did everyone else in the family, and I'm already planning to make them again tomorrow! Also, I LOVE the simplicity of this recipe. Took no time at all to make/clean up! Sounds like a very comforting meal!! These were delicious! I was on a cheese kick, so for dinner tonight I made these w/ the lighter baked mac & cheese for my hubby and I. 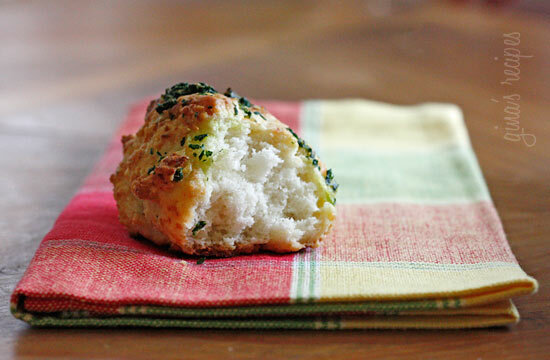 The garlic parsley butter is a nice treat to the already delicious biscuit. Having easily devoured tons of the cheddar bay biscuits at Red Lobster, this is a fantastic and healthy substitute. On a side note, the mac & cheese was creamy, decadent and hearty. We make so many recipes of yours in our house and they're all awesome! I have these in the oven RIGHT NOW! They smell amazing and I cant wait to try them!! I'll be honest Amanda, I'm not sure. I didn't even know they sold gluten free bisquick. Let me know how it turns out if you make it. Just wondering how the nutritional info would change if we were to use the Gluten Free Bisquick? Or if you think that would affect the recipe much? I live in Canada but make regular trips to the US, I dont want to have boxes of mix sitting there since I dont bake or eat pancakes but these look magically delicious and a must try! Did you ever try this? I have some and was considering it. I am wondering what the texture will be like, but I may just have to risk it and see! Aren't they great!! Great idea making them bigger to eat just one. These are AMAZING! I used Cabot 75% reduced fat cheddar and they were delicious. Definitely recommend making a half recipe if you don't have help eating these or have a hard time with self control. It took a LOT for me to limit myself to two. 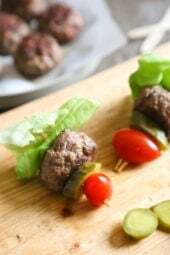 This is a wonderful recipe for entertaining those who aren't calorie counting – they will never know and you can maintain your count! Thank you for another superb recipe, Gina! I made these tonight and screwed something up! They were as flat as pancakes, can't sure what I did, I figure it's one of 3 things, I halved the recipe and added too much milk, since they were very watery, I over mixed despite your warnings, or I was lazy so I used minced garlic and the oil did it! They were still VERY yummy!!! Just made these last night…AMAZING!!! I had never tried the HeartSmart bisquick before and was worried it would taste "healthy"…tasted like any other biscuit! The garlic and cheddar made it so delicious! Will definately be making this over and over again. Ok just found out about this site. Gonna be trying many recipes. Anyway how many muffins could I eat without overdoing the points? I figure 2. Fantastic! Thank you so much for all your great recipes, you've helped my husband me learn to eat healthier and lose weight! These are just the best, thanks so much for the recipe! I've made them twice now and my family can't get enough. They are so quick and easy and they present really well. These are absolutely amazing, and I don't feel guilty eating them! Thank you Gina, your blog is a life-saver! I made these last night and added crumbled up reduced fat turkey bacon to the mixture. It added so much to the flavor–the smokyness of the bacon mixed with the tang of the cheddar–and consistency–the crunchy bacon breaking up the fluffyness. It was delicious! I love your recipes. I made 1/2 the recipe for these awesome biscuits, and I ate 2 of them. My husband ate the rest! Wow! They were great. I couldn't find Heart Smart Bisquick in my local store there was another brand 'Krusteaz' that had a heart smart option I am hoping that it will have the same yummy effect. Thanks! I made these tonight for a dinner party and they were a huge hit. I took out the parsley and added parmesan cheese and oregano. They were great! I think this would be a great pizza dough! I warned you all!! Glad you liked them, I knew you would. i'm back with an update! i made them!! sooo good and easy, which is important because i can mess things up really fast. totally should have 1/2d the recipe because now i have a whole bunch of delicious biscuits all to myself…. mm. These are so good and so easy. I just whipped some up and my husb's still working on the rest of dinner. Ha ha ha I won! Hi! I have really been enjoying your blog, so I added you to my list of "foodie blog shoutouts" on my own blog! I have a great group of dedicated readers that really enjoy the recipes I post, but I can't possibly link all of the ones you have that make my mouth water. If you have a page of other blogs you enjoy, I'd love to be on it (if you enjoy my blog as well). Thanks again for the wonderful recipes! Shut the front door! These were too good! OMG! So I halved the recipe – I ate one, the boyfriend ate 6. He literally pulled the plate to him and went to town. Had the nerve to ask "did you want some?" as if I hadn't made them. Thanks for a wonderful substitute for a Red Lobster favorite. Having these tonight…only I subbed chives for the parsley and pepperjack for the cheddar. WOW. These look beyond yum & beautiful. Cheese Biscuits are a secret love of mine! Debbie, so happy you enjoyed them, it's hard to eat just one! loulee, I'll try to work on one from scratch. I love to bake biscuits with Bisquick (original), I'll try with this one! OM-FREAKING-G forget the company, i am so having these all by myself. and by the way i LOVE that you have the new and old points both, because a LOT of people are staying on the Old Plan including myself. You did it again Gina! I just made these tonight for dinner. My family gave them rave reviews. My husband loved them so much he ate 4 (12+ points). I served them along side your Baked Potato Soup. The entire meal was awesome, and perfect on this cold California night. You make being on Weight Watchers a treat. I've told all the people at my meetings about your website. Thank you so much for your yummy recipes. Keep up the good work. I made these last night to go along with some chili. They were so easy to make, and SO delicious. My boyfriend didn't even know they were WW friendly! Kudos, Gina! These sound delish. But we can't get Heart smart bisquick in the UK, any suggestions for an alternative? I'm sure Mexican cheese is wonderful here, and with cilantro instead of parsley, yum! Would be awesome with a bowl of chili!! Jo- Thank you from the bottom of my heart! Heather- Sooo easy! I like easy when it comes to baking. Filipino Chicken is a favorite in my house too these days. I made these tonight, and these were delicious. I didn't have the cheese so I just left it out. I made them as a side with your Filipino Adobo Chicken, which is my fam's favorite!!! Thanks for the great meals. ummm….yummm! 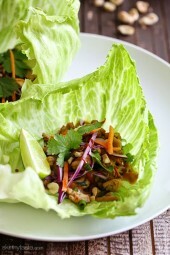 Making these tonight to go with Gina's 3 Bean Turkey Chili that I have in the crock pot right now! The house smells awesome! Perfect timing…thanks, Gina! What's the difference between the Heart Smart and the regular Bisquick? By the way, just wanted you to know that at my last WW meeting, we talked about ways to manage your environment and keep your kitchen healthy. During discussion, I stood up and gave everyone your website and raved about the recipes here!! Keep up the awesomeness. My husband and I thank you!! I made these but with cilantro and mexican blend cheese to go with chili. they were so good! I was wondering if these would be good using taco cheese? That is all I have on hand and wanted to try them tonight. Or would these be OK without the cheese? I too LOVE these at Red Lobster and am so happy you posted this recipe. I just made them and they not only taiste delicious they look great as well. I made them with the potato soup and it was a GREAT, AMAZING, YUMMY dinner. looks devine i'm gonna make those biscuits. These look amazing, I can't believe each has fewer than 100 calories!! Wonderful looking biscuits. I can't wait to try them. I'll play around with making this from scratch for those of you who can't find Bisquick. This would be great with soup, I'm thinking cheddar broccoli potato soup! I must try to make these, my mouth is watering just looking at that photo. THANK YOU! I have been craving cheddar bay biscuits from Red Lobster for weeks. I was going to make them at home but the recipe I have is BAAAAAADDD. Making these tonight! I've been planning on making your cauliflower soup before winter is over, and i think these would go great with that! Yum! I bet these would be absolutely wonderful on the side of a warm, hearty soup or chili. Such an easy recipe! Thanks for sharing, Gina. I'd love to see a from scratch option. Also, Marianne, I would divide them up and freeze on a cookie sheet before baking. When froozen put them in a sealed bag. Then you can bake them a few at a time, they will just take a few minutes longer. WOW! These look fantastic! I am amazed you made something so evil sounding so healthy! Thanks, Gina, can not wait to try them! 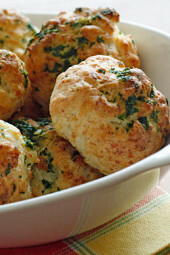 yum..I would guess these taste like a healthy version of the red lobster biscuits! thanks! They sell Heart Smart Bisquick on amazon, so you could always buy it there (I linked to it in my ingredients). If not, I'm sure you could find a copycat recipe for it online. Garlic powder would be fine if you're allergic, but I would recommend fresh to everyone else. Morris Family- Using whole milk would work, but the points would increase, so maybe you want to do half milk, half water. Marianne, I think I would bake them first, then freeze and reheat in the oven later. We freeze French bread all the time, and it reheats perfectly. They look so good … I wonder if there's a way to make them from scratch. Does anyone have tips for freezing these? I am pregnant and trying to freeze some of my recipes for after the baby arrives, but I'm not sure if I should freeze the dough in one big lump, or split the dough into individual servings then freeze, or go ahead and bake them and freeze the completed biscuits. Suggestions? Marianne, You can freeze the baked biscuits. Let cool and put in zip lock. It's best if you can draw most of the air out of the bag to avoid freezer burn. I don't think Heart Smart Bisquick is available in Canada (if anyone has seen it, please let me know). Gina, can you recommend a substitute? @Cyber Cyster- I make these at home, almost the exact same recipe, except I use garlic powder, so you should be fine! OMG! How did you know I was searching for these the other day on your site! This is great. Thank you Gina!!! I have been making these for years now, just without the parsley. I'll have to try it the next time I make them. They are always a big hit! Silly question: I don't drink milk since it is too high on points (why drink your points when you can eat your points!?!?). But we do keep whole milk in the fridge for the kids. Can I substitute the fat free milk with whole milk and not mess up the consistancy? Yum!! Can't wait to try these. Gosh, those look and sound delish! Is Heart Smart Bisquick in Canada? Did you end up finding it in Canada? I did not find Heart Smart Bisquick, however I did find Betty Crocker Bisquick at our local Sobeys. I looked around for Heart Smart but couldn't find it anywhere. I am not able to find the Heart Smart Bisquick in Nova Scotia either. I can find the Bisquick. Too bad I used it often when I was living in Texas…. 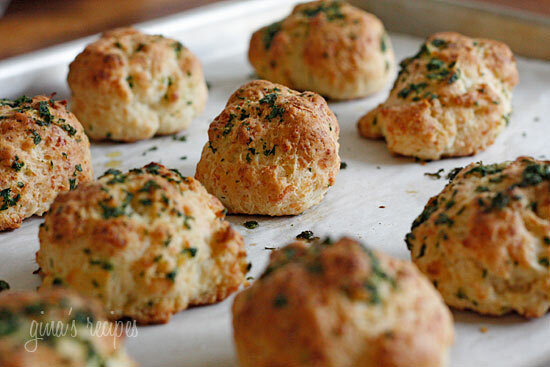 These look just like the biscuits from Red Lobster that are SO yummy and SO bad for you. Thank you for making a healthy and equally yummy substitution! I can't wait to try them! I'm allergic to fresh garlic, would you recommend I substitute garlic powder or minced garlic? Thanks! Do you mean fresh as in uncooked? Then you could probably roast the garlic in the oven before mixing. Also, minced garlic IS fresh garlic, just chopped up. Garlic powder- I do not think it would give as strong and "garlic-y" a flavor. The biscuits look pretty light and tasty. Yum! !